Do you have photos, historical accounts or other items pertaining to the St. Paul area? Would you like to share this historical information with the world? LakesnWoods.com would like to publish your St. Paul photos (current or historical) or historical accounts on this website. Original materials can be returned and your privacy will be respected. Saint Paul, abbreviated St. Paul, is the capital and second-most populous city in the U.S. state of Minnesota. The city lies mostly on the north bank of the Mississippi River, downstream of the river's confluence with the Minnesota River, and adjoins Minneapolis, the state's largest city. Known as the "Twin Cities", these two cities form the core of Minneapolis-Saint Paul, the sixteenth largest metropolitan area in the United States, with about 3.5 million residents. The city's population at the 2000 census was 287,151. Saint Paul serves as the county seat of Ramsey County, the smallest and most densely populated county in Minnesota. Saint Paul history and the city's growth as a landing port are tied to water. 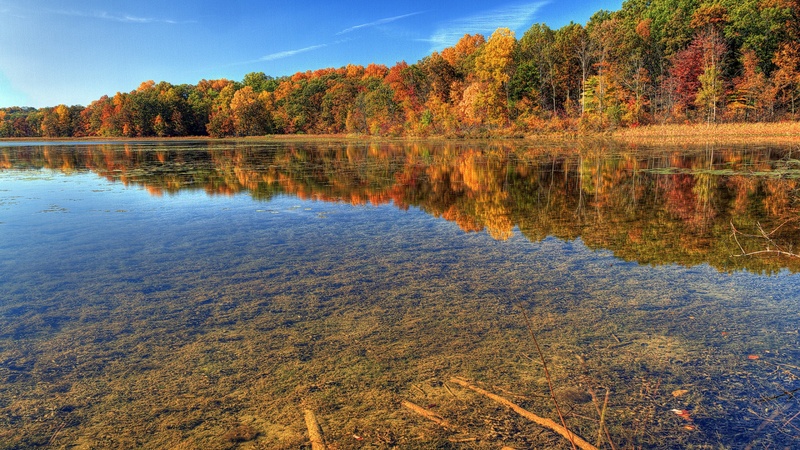 The city's defining physical characteristic, the Mississippi and connecting Minnesota Rivers were carved into the region during the last ice age. Fed by receding glaciers and Lake Agassiz ten thousand years ago, torrents of water from a glacial river undercut the river valleys. 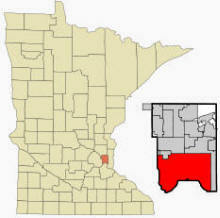 The city is situated in east-central Minnesota. The Mississippi River forms a municipal boundary on part of the city's west, southwest and southeast sides. Minneapolis, the state's largest city lies to the west; Falcon Heights, Lauderdale, Roseville, and Maplewood are north; Maplewood is also to the east; the cities of West Saint Paul and South Saint Paul are to the south; and Lilydale, Mendota and Mendota Heights lie across the river from the city to the south. The city's largest lakes are Pig's Eye Lake, in the river, Lake Phalen, and Lake Como. According to the United States Census Bureau, the city has a total area of 56.2 square miles (145.5 km²). 52.8 square miles (136.7 km²) of it is land and 3.4 square miles (8.8 km²) of it (6.07%) is water. As of the 2000 U.S. Census, there were 287,151 people, 112,109 households, and 60,999 families residing in the city. The racial makeup of the city was 67.0% White, 11.7% African American, 1.1% Native American, 12.4% Asian (mostly Hmong and Vietnamese), 0.07% Pacific Islander, 3.8% from other races, and 3.9% from two or more races. Hispanic or Latino of any race were 7.9% of the population. There were 112,109 households, out of which 29.1% had children under the age of 18 living with them, 36.1% were married couples living together, 13.9% had a female householder with no husband present, and 45.6% were non-families. 35.9% of all households were made up of individuals and 9,4% had someone living alone who was 65 years of age or older. The average household size was 2.46 and the average family size was 3.32. In the city the population was spread out with 27.1% under the age of 18, 12.5% from 18 to 24, 32.0% from 25 to 44, 18.0% from 45 to 64, and 10.3% who were 65 years of age or older. The median age was 31 years. For every 100 females there were 93.6 males. For every 100 females age 18 and over, there were 89.5 males. The median income for a household in the city was $38,774, and the median income for a family was $48,925. Males had a median income of $35,111 versus $29,432 for females. The per capita income for the city was $20,216. About 11.7% of families and 15.6% of the population were living below the poverty line, including 23.2% of those under age 18 and 9.7% of those age 65 or over. ST. PAUL, the county seat and the capital of Minnesota, first settled by Pierre Parrant in 1838, received its name from a little Catholic chapel built in 1841 under the direction of Father Lucian Galtier, who in the preceding year had come to Mendota, near Fort Snelling. The history of the building and naming of the chapel, with the adoption of the name for the village and city, was written in part as follows by Galtier in 1864, at the request of Bishop Thomas L. Grace. "In 1841, in the month of October, logs were prepared and a church erected, so poor that it would well remind one of the stable at Bethlehem. It was destined, however, to be the nucleus of a great city. On the 1st day of November, in the same year, I blessed the new basilica, and dedicated it to 'Saint Paul, the apostle of nations.' I expressed a wish, at the same time, that the settlement would be known by the same name, and my desire was obtained. I had, previously to this time, fixed my residence at Saint Peter's [Mendota], and as the name of PAUL is generally connected with that of PETER, and the gentiles being well represented in the new place in the persons of the Indians, I called it Saint Paul. The name 'Saint Paul,' applied to a town or city, seemed appropriate. The monosyllable is short, sounds well, and is understood by all denominations of Christians. . . . Thenceforth the place was known as 'Saint Paul Landing,' and, later on, as 'Saint Paul'" (History of the City of Saint Paul by Williams, 1876, pp. 111-12). The post office was established in St. Croix County, Wisconsin Territory, on April 7, 1846; Jacob Wales Bass, born in Vermont in 1815, came to St. Paul in 1847 and was considered the first postmaster, although he served from 1849-53 at his hotel, the St. Paul House; he died in St. Paul in 1889. St. Paul was organized as a village or town November 1, 1849, and was incorporated as a city March 4, 1854, then having an area of 2,560 acres, or 4 square miles. It received a new city charter March 6, 1868, when its area was 5.45 square miles, to which about 7 square miles were added February 29, 1872, and again 3 square miles March 6, 1873. West St. Paul, now Riverside, which had belonged to Dakota County, was annexed November 16, 1874, by proclamation of the popular vote ratifying the legislative act of March 5, 1874, whereby the total area of the city was increased to 20 square miles. Further large annexations, March 4, 1885, and February 8, 1887, adding the former McLean and Reserve Townships, extended St. Paul to its present area, 55.44 square miles, which is very nearly the same as the area of Minneapolis. Prof. A. W. Williamson, in his list of geographic names in this state received from the Dakota, wrote: "Imnizha ska,--imnizha, ledge; ska, white; the Dakota name of St. Paul, given on account of the white sandstone cropping out in the bluffs." In the simplest words, this Dakota name means "White Rock." As a familiar sobriquet, St. Paul is often called "the Saintly City"; Minneapolis similarly is "the Mill City" or "the Flour City"; and the two are very widely known as "the Twin Cities." 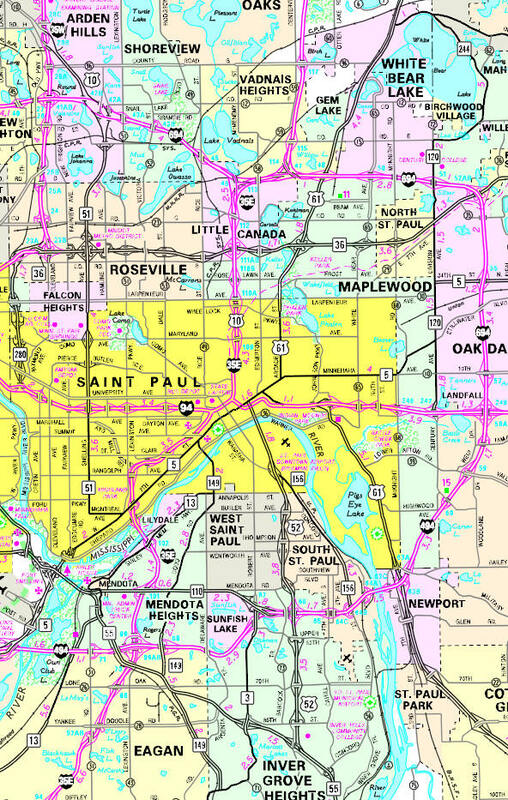 A few districts of St. Paul have been noted in the preceding list, namely Merriam Park, Riverview, and St. Anthony Park; and the railway stations of Hazel Park and Highwood, likewise before noted, also are in St. Paul. This city has numerous other residential or partially mercantile and manufacturing districts, which may properly be briefly mentioned here. Several districts designated as parks, however, are wholly or partly occupied by residences, this being the case with each of the districts called parks in the following list. Dayton's Bluff, at the east side of the Mississippi in the southeast part of St. Paul, has a large residence district on the plateau extending backward from its top. The name commemorates Lyman Dayton, a former landowner there for whom a village and township in Hennepin County were named. On the edge of the southern and highest part of the bluff, in Mounds Park, is a series of seven large aboriginal mounds, 4 to 18 feet high, from which a magnificent prospect is obtained, overlooking the river and the central part of the city. Dayton was born in Southington, Conn., August 25, 1810, and died in St. Paul, October 20, 1865. He came to Minnesota in 1849, settling in this city, and invested largely in real estate; was the projector and president of the Lake Superior and Mississippi Railroad. Arlington Hills and Phalen Park are northeastern districts, the second being named from Phalen Lake and Creek, for Edward Phelan (whose name was variously spelled), one of his successive land claims, in the earliest years of St. Paul, having been on this creek. Como Park, the largest public park of the city, with adjoining residences, encloses Lake Como, named by Henry McKenty in 1856 for the widely famed Lake Como adjoining the south side of the Alps in Italy. He was born in Pennsylvania in 1821, settled in St. Paul at the age of 30 years, dealt largely in city lots and farmlands, and died in this city August 10, 1869. Lexington Park is a western central district, named from Lexington, Mass., where the first battle of the Revolutionary War was fought, April 19, 1775. Farther northwest and southwest, respectively, are the districts of Hamline and Macalester Park, having the Methodist Hamline University and the Presbyterian Macalester College, named in honor of Bishop Leonidas Lent Hamline (1797-1865) of Ohio, and Charles Macalester (1798-1873) of Philadelphia, a generous donor to this college. In and near Groveland Park, a district at the west side of the city, bordering on the Mississippi, are three large Catholic institutions, St. Paul Seminary, University of St. Thomas, and College of St. Catherine. St. Anthony Hill, often called simply the Hill District, comprises a large residential area on a broad plateau that was crossed by the earliest road leading from the central part of St. Paul to the Falls of St. Anthony and the city of this name, which in 1872 was united with Minneapolis. At Seven Corners, southwest from the business center of St. Paul, streets radiate in seven directions, with buildings on the intervening corners of the city blocks. The St. Paul Business Directory is Coming Soon!